Is this not the cutest car ever? This sounds terribly female, but I love this car. Have since it was introduced. Itâ€™s only gotten better: smoother, quieter, more refined and Hipper; if that is possible! Our test vehicle, the Kia Soul + came equipped with all the goodies, including the â€œPrimoâ€ package which includes a knockout-almost a convertible-panoramic sunroof that covers the length of the car. The dogs love it. I love it! 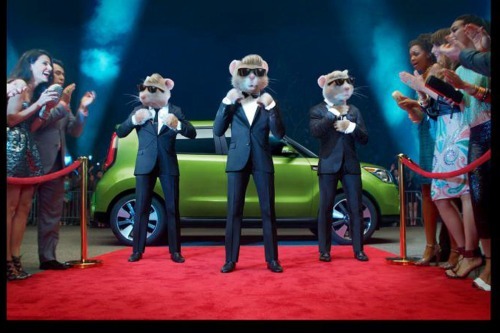 The 2014 Kia Soul is proof that things DO get better. The Soul appeals to not only the young set which, no doubt, it was designed to do, but also to those of us in our â€˜second half of life.â€™ One is never too old to have fun and combining fun with what we drive is all the better. Right away I noticed the switch for directing the speakers to beat to the music or just change colors, on/off. Canâ€™t wait until itâ€™s dark and I can drive the Soul and operate this feature. Our top-of-the-line Soul + came equipped with several options, sky-rocketing the total vehicle price to over $24,000; high for a Soul. Options included two packages: Audio and the Primo package. The former includes automatic climate control and navigation with 8-inch screen and SiriusXMTraffic ($1,400). The Primo package includes front fog lights, Panoramic sunroof with power sunshade, push button start w/smart key, leather seat trim, power driverâ€™s seat, heated and ventilated seats, leather-wrapped steering wheel/shift knob, heated steering wheel, engine immobilizer ($3,000). Additional options were UVO with e-Series (rear camera display, automatic on/off headlights, $500), and carpeted floor mats ($115). One could do without the expensive $3,000 Primo package as it includes those goodies one expects in a luxury vehicle. The Kia Soul, hardly a luxury boat, is categorized as a â€˜small wagon,â€™ not what one would call luxury. Except that those who are into this car love decking it out; it is a candidate for modifying. The 2014 Soul brings the first major redesign to this 4-year-old beauty, complete with a redesigned chassis and frame (very noticeable), and a quieter, more soothing riding car. The word quality comes to mind. Kia offers two engine choices for 2014: The 1.6-liter and the 2.0-liter, both 4-cylinders. Opting for theÂ 2.0-liter engine is the best choice. Smooth, quiet and peppy, the 2.0-liter handles the Kia respectfully. Paired with Kiaâ€™s six-speed automatic transmission, the Soul also sports the active Eco system, saving on fuel. Standard features are plentiful, as is the case with all Kia vehicles. Anti-lock brakes, traction control, Electronic stability control, vehicle stability management and hill assist are the kinds of safety features not expected on a small compact car. Oh, and tire pressure monitoring system, too. The Soulâ€™s interior quality is much improved, cargo capacity is larger and new items, such as the panoramic sunroof have been added as upgrades. Â A UVO eServices package is available and includes streaming internet radio capability for Smartphone users. Owners may think twice about coughing up the extra dough for SiriusXM radio just so they can watch the graphics displayed on the screen. The pros outweigh the cons in the new Soul, like loads of available features, an attractive cabin with user-friendly controls and ample passenger space. The generous warranty is also a plus, of course, The cons, well, they are few, such as the desirable options can only be purchased in expensive packages. Three trim levels are available: Base, + (plus) and ! 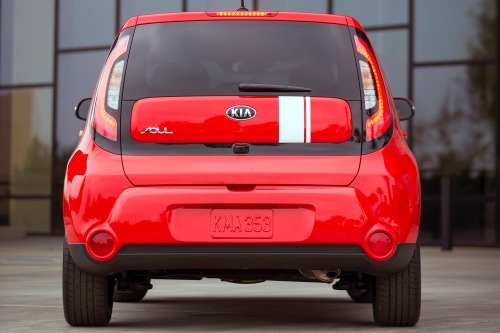 (exclaim).Â Our test Kia Soul + adds the more powerful engine, 17-inch alloy wheels, keyless entry, cruise control, front seat center console storage with armrest, and a fold-down rear seat armrest. This five-passenger, 4-door hatchback of a wagon offers 16, 17 and 18-inch wheels. An alternative to the usual sedans and hatchbacks, Soul has so much more personality. MSRP: $18,200 total vehicle price $24,010; destination $795. EPA fuel economy: 23/31 mpg., 26 avg. Mazda wins a lot of awards; or so it seems. Car & Driver Magazine has given the Mazda3 and Mazda6 a spot in their 10 Best Cars category several times; something like the 29th or 30th time Mazda vehicles have been awarded. Easy to understand after spending a week in the Mazda CX-9 SUV.Â A feature attracting awards and praise is Mazdaâ€™s SKYACTIV technology, and their â€œSoul of Motionâ€ design. This writer is partial to the ever-popular MX5 Miata sports car, so driving a Mazda of any ilk is usually a favorable experience. 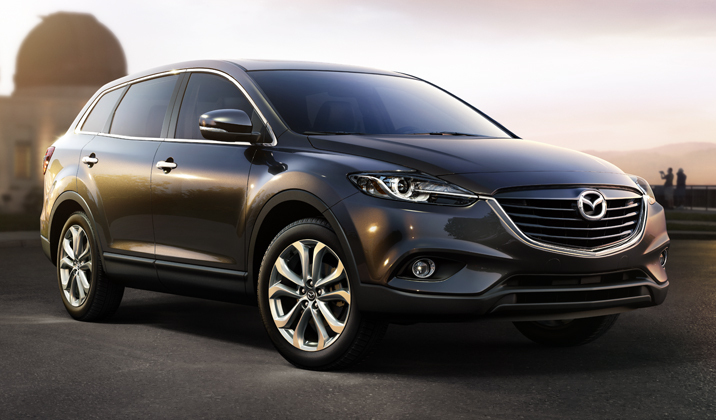 Well equipped, the Mazda CX-9 SUV offers plenty. Options on our 7-passenger Grand Touring CX-9 included rear bumper guard stainless ($150), GT Tech package (Bose audio w/10 speakers, Satellite radio w/4-mth subscription, $2,435. Standard equipment on the Grand Touring trim level includes steering wheel with audio and cruise controls, power front windows, leather-wrapped shift and steering wheel, heated 8-way power driver seat and power lumbar w/three position memory, heated power front passenger seat, leather trimmed seats, rain sensing wipers, power open/close lift gate, 60/40-split fold down 2nd and 3rd row seating. Safety equipment includes the usual: rear backup sensors, rear cross traffic alert, 3rd row side air curtains w/rollover protection, blind spot monitoring system, EBD, Brake assist, auto on/off Bi-xenon headlights, fog lights and heated power mirrors. Dynamic stability control, traction control, dual advanced front and side impact airbags, anti-theft engine immobilizer, anti-theft alarm, side-impact door beams, etc. The CX-9â€™s sound system includes AM/FM/CD with six speakers, Bluetooth hands-free phone/audio and 5.8-inch color display camera. Using the nav in the CX-9 was easy and all controls are easily reached. Driving the Mazda CX-9 and 7-passenger Hyundai Santa Fe back-to-back made for good comparison. The Santa Fe seemed and drove as though it was much larger; the CX-9 a more comfortable and easier to handle SUV. The Mazda CX-9, Mazdaâ€™s top-of-the-line SUV, is available in three trim levels: Sport ($29,985), Touring (32,480), Grand Touring ($35,035). New for 2014, the Touring and Grand Touring models get the new cross-traffic alert system. The AWD versions come standard with a towing prep package. Also available on the Grand Touring package is a rear entertainment system, with 9-inch screen. The Grand Touring version adds 20-inch wheels, bi-xenon headlights, LED running lights, fog lights, automatic wipers, power liftgate, upgraded interior and exterior trim, keyless entry/ignition, driver memory functions, auto-dimming rearview mirror, and second row center armrest with console storage. Competition for the Mazda CX-9 are the Dodge Durango, Chevrolet Traverse (and GMC Acadia), and Ford Flex. Those things in the CX-9â€™s favor include its responsive steering, strong V-6 engine and spacious interior. Third-row seats are easily accessible and standard three-row seating tri-zone automatic climate control is a nice touch, also. With pros must come some cons, of course, and while they are few, there do exist a few: The CX-9â€™s crash-test ratings arenâ€™t outstanding, itâ€™s IP and console with navigation/audio features is somewhat dated. 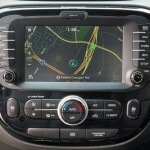 The 5.8-inch touchscreen new in 2013, is small for a vehicle of this size and its interface isnâ€™t top-notch. Although easily operated, for those into high-tech, the CX-9 may get a C. The rear doors are long and the ride with the 20-inch tires is a tad stiff. A great highway cruiser, as well as around-town vehicle, the CX-9 is a Mazda at heart; sporty and fun. You canâ€™t take the heart out of a Mazda, no matter the size. EPA Fuel Economy: 18/22 mpg. Warranty: 36 mths./36,000-mile bumper-to-bumper; 60 mths./60,000-mile powertrain; 24-hour roadside assistance. PLYMOUTH, Mich., Nov. 11, 2013 /PRNewswire/ –Leading global developer of automotive turbochargers Honeywell, announcedÂ the results of a recent survey stating that 70 percent of Americans have never driven a diesel-powered vehicle (73 percent of those are Millennials, under the age of 35, who have never driven a diesel-powered truck or car. However, 56 percent recognize that running diesel fuel is more fuel efficient than using gasoline. Despite this lack of diesel driving experience, consumers were not only aware of the diesel engineâ€™s benefits, including the fact that diesel engines can produce more power than traditional gasoline engines (65 percent). Nearly three in five adults (59 percent), and more than half of Millennials (56 percent), said they believe running diesel fuel is more fuel efficient than gasoline. According to Honeywell Transportation Systems President and CEO Terrence Hahn, “Turbodiesels and downsized turbocharged gasoline engines provide both automakers and consumers a no-compromise solution of greater fuel economy and performance with the added benefit of being more environmentally-friendly.” Turbocharged diesel engines, therefore, have the opportunity to greatly impact todayâ€™s younger car buyer. While not often considered a factor in the driving experience, fuel economy (23 percent) was ranked the second most important factor for Americans when determining whether a car is fun to drive â€“ behind only good handling (47 percent). When Millennials determine whether a car is fun to drive, they are more likely to say fuel economy (23 percent) contributes to this than either speed (16 percent) or horsepower (8 percent). Nearly two-thirds of Americans (65 percent) said they believe diesel engines can output more power than traditional gasoline powered vehicles. For the U.S., Honeywell has doubled its estimate for diesel sales penetration by 2018, to 6 percent from 3 percent. By 2018, diesel and gasoline turbo engines combined are expected to account for about 20 to 25 percent of U.S. new-vehicle sales. For more information, visit Honeywe http://turbo.honeywell.com or follow us on Twitter at @honeywell_turbo. Redesigned for 2013, the Lexus GS 350 feels more like an â€˜upscaleâ€™ sedan, rather than a sport sedan.Â Traditionally, Lexus produces what is known as the comfortable car, although the design folks of late at the automaker have Â produced cars with sharper performance and lines. Entering a little bit different territory, Lexus has reshaped past perceptions of their 2013 GS 350 . Slightly wider and taller, much stiffer and with vastly improved steering feel, the GS 350 may at long last be a real competitor to those German sport-luxury sedans. Our test vehicle in Meteor Blue Mica didn’t hurt any either. Not very different than its third-generation predecessor, the 2013 GS 350 however, wears a little bit more aggressive skin. Length and wheelbase remain the same, but the chassis is about 2 inches wider. And while the suspension in the GS 350 is basically the same, the sedanâ€™s new rear design allows for about 25 percent more trunk space. The engine in the GS 350 is Lexusâ€™ same 3.5-liter V6, but with a little bit better fuel economy and slightly more power. The 2013 GS 350 gets a revised suspension, a stiffer body structure and a quicker steering system, all helping to make the GS 350 the best-handling Lexus to date. The sedanâ€™s interior is plush, and functional at the same time. What has been shed is replaced by new features such as touchpad-operated infotainment system, and comfortable, form-fitting sport seats. Make no mistake, the 2013 GS 350 is a large vehicle. A great road car, the 350 GS is easy to maneuver despite its size, and has added sporty equipment making a worthy contender. 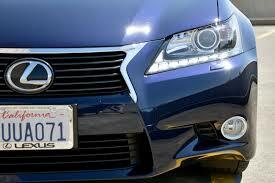 Better equipped than previous GS 350â€™s the 2013 model is available in one trim level: luxury. Well-appointed the GS includes such amenities as 17-inch alloy wheels, automatic Bi-xenon headlamps, moonroof, auto-dimming mirrors, leather, power tilt-and-telescoping steering wheel with controls, 10-way power seats, foglights, keyless ignition. And of course, the latest in electronics is standard, with Bluetooth phone/audio connectivity, 12-speaker surround sound audio system with CD, Satellite, HD radio and USB/iPod capability. An 8-inch display with touchpad is also standard. Our test GS 350 came equipped with several dollars worth of options, including a $6,090 Luxury Package which includes rain-sensing wipers, heated and ventilated front seats and power rear sunshade, 18-inch alloy wheels w/all-season tires, adaptive variable suspension, sport S and drive mode, wood and leather trim, 18-way power seats, Lexus passenger seat memory system, three-zone automatic climate control, rear-door manual sunshades, heated steering wheel, windshield wiper deicer, water-repellant front door, high intensity interior heater. Our test 350 also came equipped with the HDD navigation package with 12.3-inch high-resolution split screen multimedia display and Lexus Enform w/Destination, eDestination, App Suite, SiriusXM NavWeather NavTraffic sports/stocks (1-yr. trial): $1,735. Trunk mat ($105), and Rear Lip Spoiler ($395). One might be able to forego some of the above options, saving some dough. With a MSRP of $48,800, the GS 350 is fairly competitive. When you add all the goodies, youâ€™re in a different ballgame. We have to admit, foregoing Lexusâ€™ optional Mark Levinson audio system would be difficult. The sound is like few others. This writer found herself wanting to stay inside the sedan; looking for excuses to go somewhere. Powered by a 3.5-liter V6 engine 306 horsepower engine, the GS has plenty of get up-and-go. Mated with Lexusâ€™ six-speed automatic with manual shift paddle control and is the only available transmission. Consumers, though can opt for a GS 350 with either rear-wheel drive or all-wheel drive. Our test vehicle was all-wheel-drive. Estimated fuel economy is somewhere around 19/28 mpg. with rear-wheel-drive. Gas mileage suffers some when opting forÂ AWD, and comes in at 19/26/21. As expected, standard safety equipment is top-of-the-line and includes ABS, traction and stability control, front and rear side-impact airbags, front knee airbags, side curtain airbags, active front head restraints and a rearview camera. Also standard is the Safety Connect system, a traditional telematics service with automatic collision notification, stolen vehicle locator and emergency assistance button. 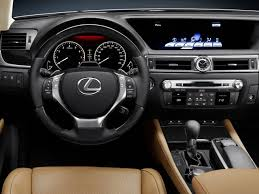 Also included on our GS 350 was vehicle dynamics integrated management, Safety Connect (automatic collision notification, stolen vehicle location, emergency assist button), white LED interior illumination, Lexus personalized settings. Adding the optional adaptive cruise control includes a pre-collision system that detects impending collisions and responds by pre-tensioning the seatbelts and activating brake assist. The GS 350 gets a little more interior space for 2013; additional head and shoulder room. Rear seat passengers get almost three more inches of hip room for 2013.compared to the previous model.The Remote Touch multimedia controller is fairly easy to use. At first, this writer had forgotten using it in other Lexus models, but then became familiar rather quickly. It features a mouselike device adjacent to the gear selector. In its second iteration, the RemoteTouch assists the driver in navigating the menus and apps of the generous infotainment system. 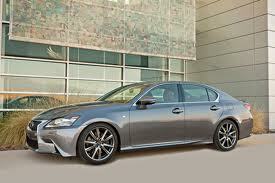 The 2013 Lexus GS 350 is quick off the line, with a breezy, gentle power. Ride comfort is a given in Lexus models and is no exception in the GS 350. No longer the soft ride it delivered in past models, the 2013 GS offers improved steering and suspension design making for a more engaged sedan. We havenâ€™t driven the F Sport package equipped GS but can only imagine a much more engaged ride. Although hard to find fault with a Lexus vehicle, it still appeals to a certain driver. However, with this new GS, there may be some converts coming over from the likes of BMW and Audi. Weâ€™ll see. MSRP: 49,800; total vehicle price $59,020; destination $895. Gas tank capacity: 17.4 gal. Warranty: 48 mths/50,000-miles Basic; 72 mths./70,000-miles powertrain; 72 mths./unlimited distance corrosion perforation; 48 mths./unlimited roadside assistance; 12 mths./10,000-miles maintenance. Offered in two different configurations, the 2013 Hyundai Santa Fe has come a long way since its introduction. Increased in size and category, the Santa Fe will take over where the Veracruz left off. In a longer version; perhaps a less distinctive variation, the seven-seat SUV might be considered by those folks yearning for the old minivan. The larger Santa Fe is 8.5-inches longer than the Sport version. Available in several iterations, one can opt for a Santa Fe, 2.4-liter, 4-door FWD, 2.4-liter, 4-door, AWD, 2.0-liter turbo 4-door FWD and 2.0-liter turbo AWD. Although crossovers arenâ€™t necessarily the roomiest of SUVâ€™s, they serve the intended purpose, which is to fit more stuff in them than in a sedan; for instance. Utility, of course, is also a plus. For 2013, the Santa Fe seating has clearly been updated, offering a more solid and comfortable seat. Â The second row of seating now slides on a 5.2-inch track for better flexibility. It also reclines and folds on a 40/20/40 split, making way for longer objects. Storage space below the cargo floor has been increased. For three-row models, there is a choice between the 40/20/40 layout or a six-passenger layout with captain’s chairs (minivan?). Soil-resistant upholstery is standard, and a great idea. At $26,000, the Santa Fe Sport is equipped with either the 2.4-liter four-cylinder engine, with 190 horsepower, or the 2.0-liter turbo four-cylinder, at 264 horsepower. The three-row model is powered by a 3.3-liter V-6 (290 horsepower), the engine in the Azera. All three engines feature direct-injection technology and six-speed automatic transmissions. Front- and all-wheel drive are available with both engines. The ride in the Santa Fe has been refined, is more quiet and accommodating. One notices a slight difference between the Kia Sorento and the Santa Fe, essentially the same vehicle, yet the Kia seems smoother. Rear seating is very generous, and can accommodate good size adults. Safety equipment is the usual: airbags, including a driver knee airbag, stability control, and optional all-wheel drive.Â Options include blind-spot monitors and parking sensors. Options on our Santa Fe included Leather and Navigation Package ($4,100) with side mirror-mounted turn signal indicators, heated steering wheel, leather seating surfaces w/heated 2nd row seats, power front passenger seat, navigation system w/8-inch touchscreen, dimension premium audio, HD radio technology, Dual Automatic temperature control with cleanair ionizer, rearview camera, auto diming rearview mirror with HomeLink and compass. The only other option included premium door sill plates ($135). Standard equipment includes the usual, as well: power windows/mirrors/locks, air conditioning, tilt/telescoping steering wheel, steering wheel audio/phone controls, cruise, and 17-inch wheels. The standard audio system is an AM/FM/CD player with satellite radio, USB and auxiliary ports, Bluetooth and audio streamingÂ Â with six speakers. The Santa Fe duo also gets standard Hyundai’s BlueLink telematics system. 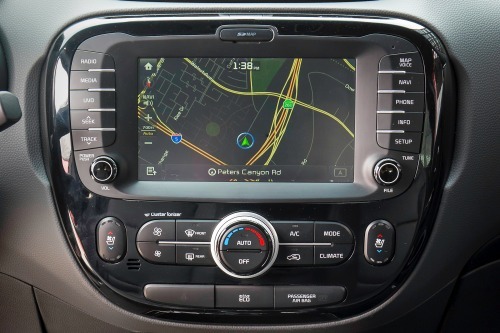 This OnStar-like system incorporates turn-by-turn navigation and Bluetooth streaming for apps such as Pandora, and works in conjunction with your smartphoneÂ Â and an owner website to set up functions like speed limits and geofencing–setting up limits on where the car can be driven. A BlueLink app for the iPhone will be available, giving consumers the ability to lock and unlock and to start the Santa Fe by remote, too. We noticed a rough engine noise and feel when starting up on a cold morning. The engine evened out after driving for 15 minutes. The low tire pressure monitor came on in day four. We also felt somewhat blind-sided when navigating curbs and corners on the driver’s side. The Santa Fe is tall and the outside mirrors so large, the low curbs are easily blocked. Even with a $4,100 option which includes the nav system, at $30,000 MSRP, the Santa Fe is a bargain. Warranty: 5 yr./60,000-mile New Vehicle; 10-yr./100,000-mile Powertrain; 7-yr./unlimited-mile Anti-perforation; 5 yr./unlimited-mile roadside assistance. Be prepared to not only take off like a rocket, but to sit low in the body-hugging sport seats. While fairly comfortable, as they hold the driver in place (a blessing at top speed), the Evoâ€™s seats are hard. This driver wanted to add a cushion for height while driving. The 2014 Mitsubishi Lancer Evolution GSR trim level is equipped with a five-speed transmission. While the MR is teamed with a six-speed Twin Clutch Sportronic Shift Transmission (TC-SST), with manual mode and paddle shifters. The GSR is easily identified by its large rear wing spoiler. Equipped with Brembo disc brakes and sport-tuned suspension, the Evo GSR rides on 18-inch performance tires. The MR is outfitted a little more so, and includes Eibach springs, Bilstein shocks and exclusive forged aluminum wheels, projector-type HD headlamps and a smaller rear lip spoiler. Standard equipment on both Evo versions includes auto climate control, cruise, CD player/MP3 Satellite/HD radio, FUSE hands-free communication system with voice-activated audio-streaming, and USB port. As with most performance vehicles, the targeted group is the young, hot-rod, modifier set. The Lancer Evo comes with the latest electronic offerings; a necessity in this focus group. Safety features on the Lancer Evo include overhead curtain and driver knee airbags, tire-pressure monitor, front and front-side impact airbags, 4-wheel anti-lock brake system, and stability and traction control systems. There exist minimal changes in the 2014 Lancer Evolution. Both GSR and MR receive an improved 6.1-inch touch panel display audio unit, including three months Satellite and HD radio. Navigation system is optional. The twin-clutched equipped MR sells for $38, 195; the GSR starts at $34,995. Both are $300 than the 2013 models. Not chump change. Which means weâ€™re talking about serious performance-minded buyers. This isnâ€™t your everyday street vehicle, nor would many want to drive it every day. While not a bad looking sports-sedan, the Lancer Evolution claims to be in competition with Ford Mustang and Chevrolet Camaro-unlikely competitors, we think. Donâ€™t expect to carry skiâ€™s or many other large loads as Lancerâ€™s rear seats are not fold-down. The trunk is small. Again, this isnâ€™t a daily-driver; well, maybe if youâ€™re 21 years old. The only option on our test Evo GSR was the Sight and Sound Package which included HD headlamps 710-watt Rockford-Fosgate Premium sound system with nine speakers, 10-inch subwoofer withpunch control and DTS; neutral surround premium-wide surround and Dolby volume; fast key entry system. When closed, the doors sound tinny, but maybe this is to cut weight for the same reason. The Evoâ€™s low-profile Yokohama tires are paired with light-weight alloy wheels. Look for the obvious bright red two-piston Brembo brakes. The Evoâ€™s GSRâ€™s interior is pleasant although not as sporty as expected. Recarro styled seats are sporty. Controls are easily reached and understood. Rear seating is somewhat roomy. The real standout, of course-in a car like the Lancer Evo is its handling power/speed. We suspect if in the wrong hands (experienced or impaired driver), it could be a little dangerous. As with the Subaru WRX, the Lancer Evo, is a very special niche vehicle. The ususal amenties are standard on the Evo GSR and include such expected goodies as fog lights, keyless entry, power windows/doors/mirrors, dual cupholders, leather-wrapped steering wheel and shift knob.